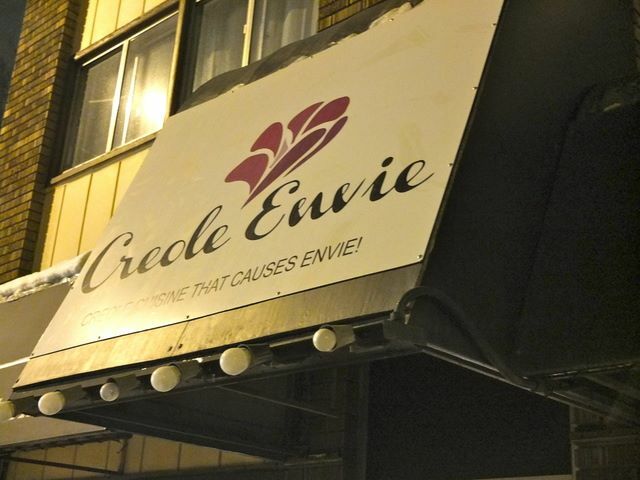 Creole Envie started as a take-out and catering business, but, last fall, moved into the former location of Highlands Kitchen on 112 Avenue. 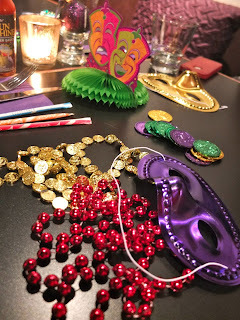 I joined the Edmonton Foodie Group for some flavours of Louisiana just before Fat Tuesday. 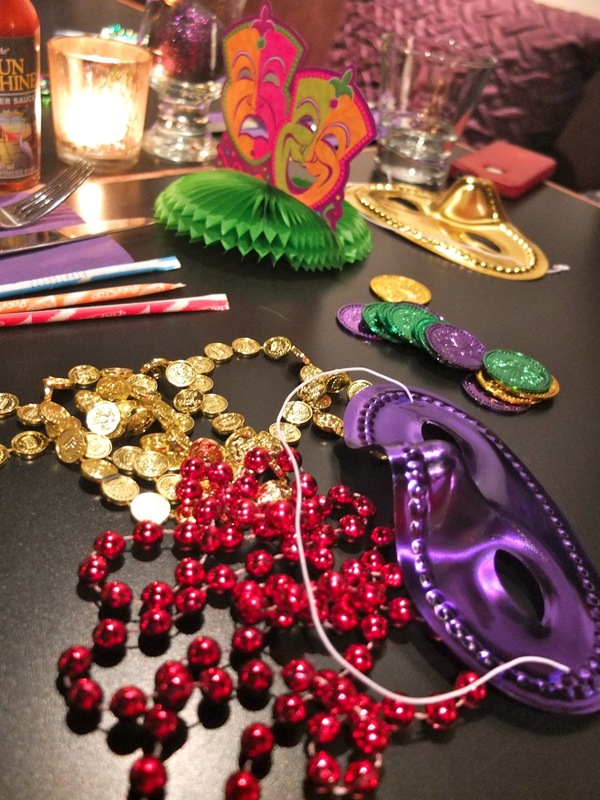 We arrived to find our tables overflowing with Mardi Gras beads, masks, and pixie sticks, and knew immediately it would be a special night! There was lots of variety in the dishes ordered by the group, so I got to taste a number of things. 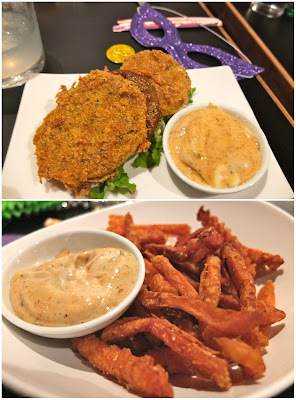 The catfish, perfectly crisp in a delicious batter, was a favorite of the night. The green beans were a touch overcooked, but still enjoyable with the accompanying pecans. The po'boy was massive and hearty, but its bun was so substantial it took away from all the flavour it enclosed. The white meat fried chicken arrived piping hot, with its delectably crispy coating enveloping incredibly juicy meat. Though I was excited to sample the smoky macaroni and cheese, the smoke flavour was overpowering. It was the disappointment of the night, and several in my group, myself included, did not finish it because of the overwhelming flavour. The service at Creole Envie to be unwaveringly friendly; even as the kitchen had trouble keeping up with our large order and there were a few mix ups, our waiter and waitress were always smiling and calm. 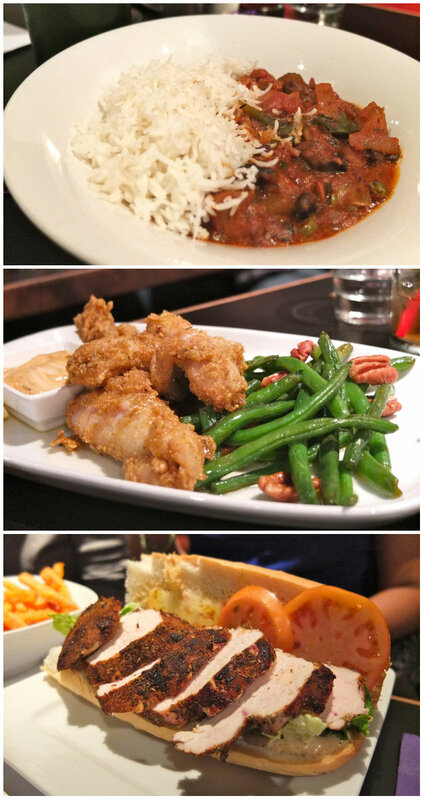 There are a few items on the menu I would not order again; however, most of what I tried was so delicious, that I know it won't be long before my next visit to Creole Envie! 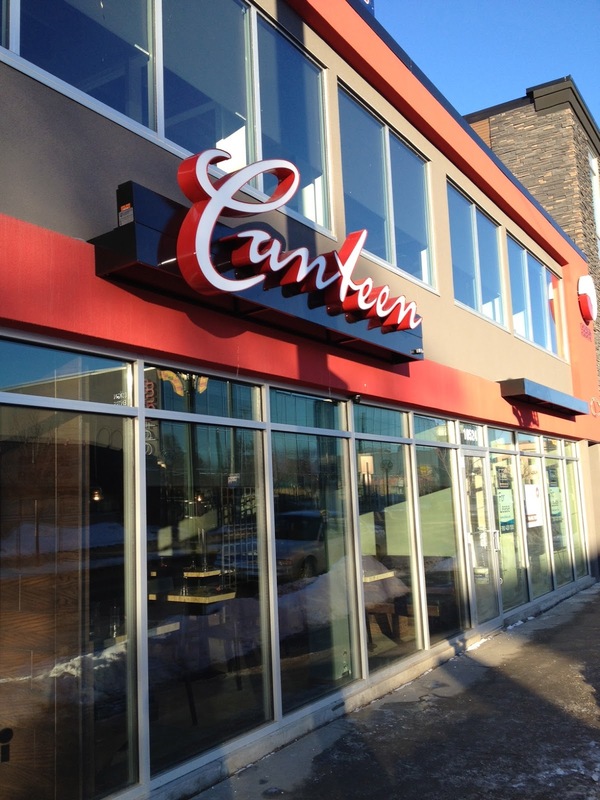 Canteen opened its doors on 124th Street in mid-December. 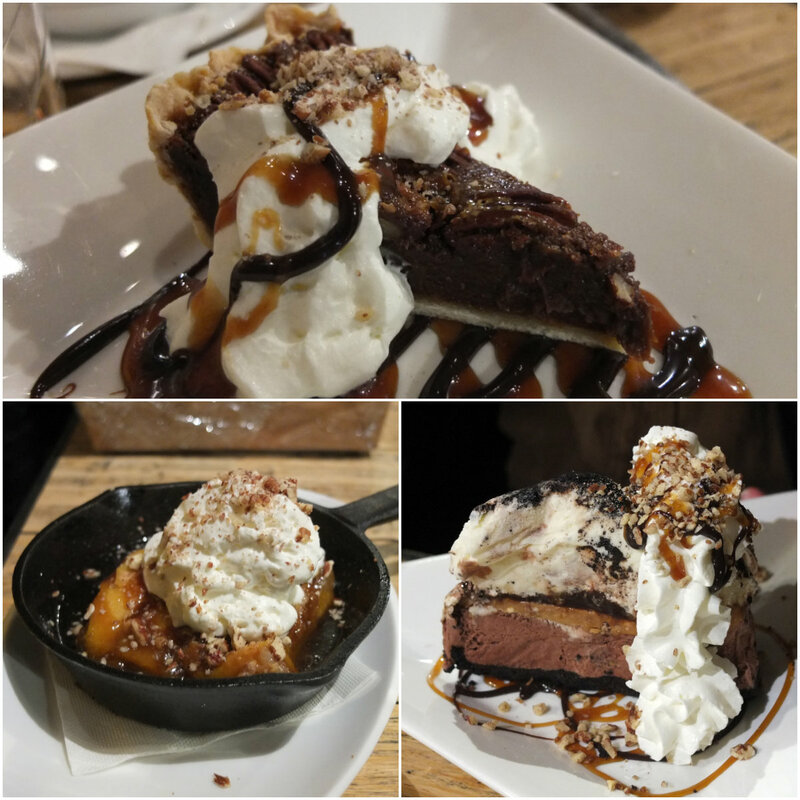 It is the free-spirited sister restaurant to the prim Red Ox Inn in terms of both menu and atmosphere with an emphasis on shared plates and a modern decor. 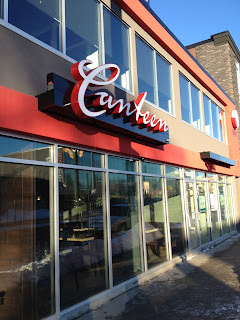 Since early January, Canteen has also been serving brunch on weekends. 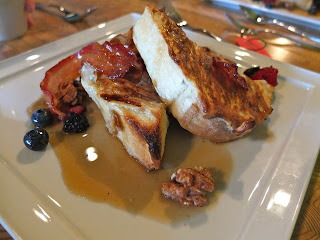 I went with the Edmonton Foodie Meetup on a Saturday morning to try it out. There were plenty of empty tables on the morning of our visit, which was in distinct contrast to a previous dinnertime visit I'd made. This gave me the chance to better appreciate the modern decor, particularly the lovely bar. I chose the pop tart from the Small Stuff portion of the menu. 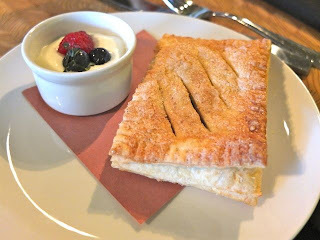 The flaky pastry was filled, but not overflowing, with Saskatoon berry preserves, and was accompanied by a tart lemon cream sauce. I enjoyed it, but, had it come out warm, I would have liked it even more. 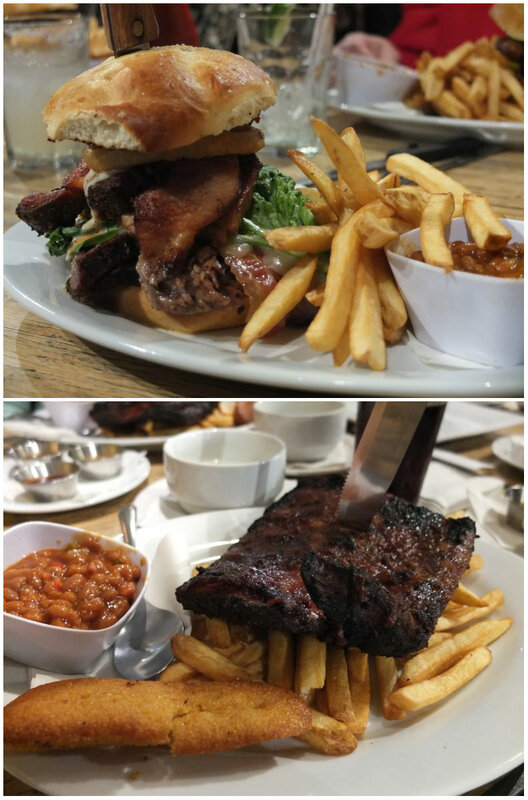 There were many tempting options in the Mains section of the menu. 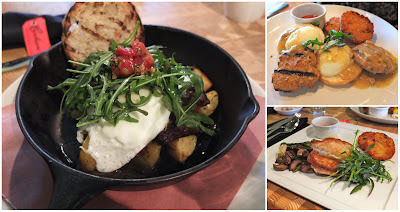 The tender short rib came with potatoes, eggs, cheddar and was lightened up with peppery arugula. 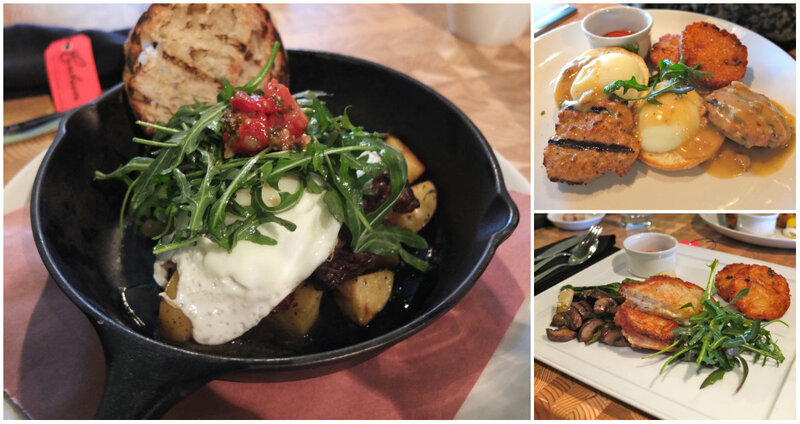 The eggs in the poached egg dish were perfectly done on top of fresh biscuits. Though I didn't sample them for myself, I heard a few complaints about the strong seasoning of the accompanying sausages. The French toast was the hit of the morning. It was stuffed with a mixture of sweet apples and rich Marscapone cheese before being dipped in egg and grilled to a perfect golden brown. The sugar bacon was the perfect pairing. The excellent food I sampled at my visit to Canteen was complimented by great service. Any concerns raised were taken seriously and dealt with quickly. There is no need for sibling rivalry here. 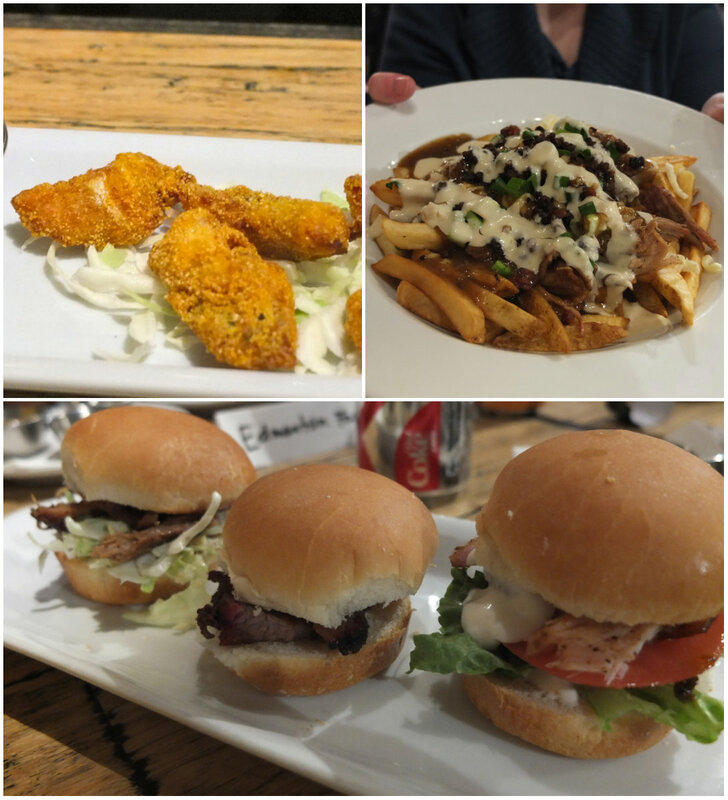 Though Canteen takes a different approach than its sister restaurant, its similar emphasis on delicious food and great service are obvious and well executed. 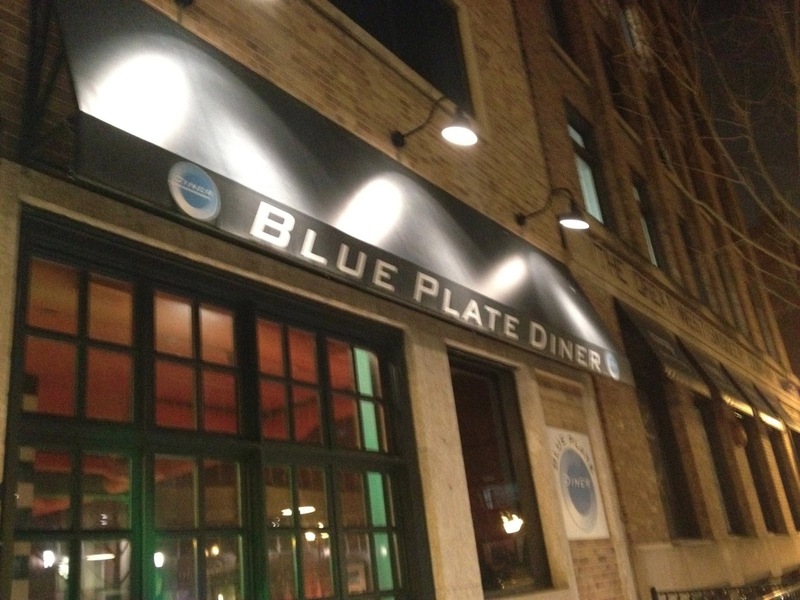 Blue Plate Diner is a popular spot on 104 Street that I've visited on several previous occasions. A few weeks ago an overhaul of their menu was debuted with several new menu items, and a few old dishes put to rest (RIP enchiladas). I returned to taste a couple of newcomers as well as sample some remaining old favorites. We started off with the new vegetarian spring rolls. They came out perfectly crisp and extremely hot, and were stuffed with carrots, sour cabbage, and onion. Though I found them overwhelmingly salty (boosted further by the soy dipping sauce), my guest was able to better appreciate the maple in the rolls as described in the menu. While I'm not vegetarian, I do appreciate the many and varied meatless options available on the menu (Specials on Mondays are always vegetarian as well, in observance of Meatless Monday). The ginger and orange stir-fry with tofu arrived spicy, as requested. 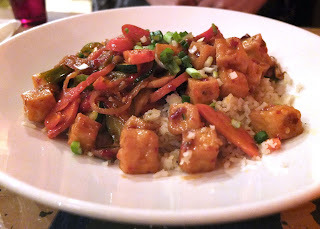 The tofu was a touch chewy, but my guest enjoyed her dish otherwise, loaded with veggies and zesty with ginger. 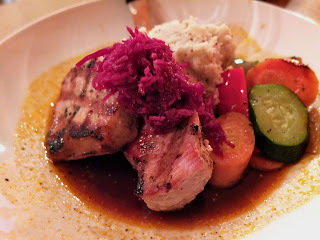 Browsing the menu, I was instantly intrigued by the cinnamon bourbon demi-glaze in the new pork dish. When I sampled the glaze on its own, I was dubious; however, on the pork, the warm flavours of the glaze mellowed to complement the meat nicely. The dish was carefully presented atop a bed of grainy dijon-laden potatoes and surrounded by vegetables. Though we'd hoped to sample their new chocolate fudge cake, the last piece went to another table just before we ordered dessert. 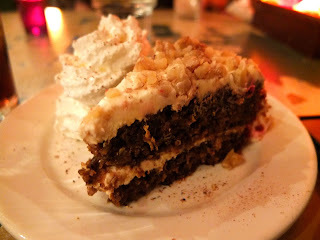 I instead enjoyed an old favorite: the the beet cake. It was spiced similarly to carrot cake, and exceedingly moist. Just writing about its thick, cream cheese icing laced the bright zest of orange has my mouth watering again. Though I wasn't blown away by the two new dishes I sampled at this visit, I appreciate Blue Plate Diner's efforts to inject new life into their already diverse menu. 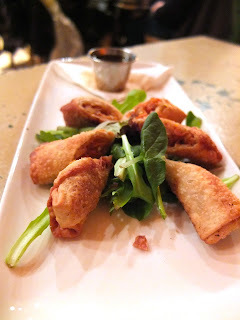 There are other new dishes I'd still like try, as well as more favourites to re-experience. Between their menu and easygoing, fun atmosphere, Blue Plate Diner is a reliable, good choice, and continues to keep me coming back.